Otjomitjira village lies amidst a breathtaking landscape in northwestern Namibia. The Himba population here is less than seventy people; another of Namibia's tribes, the Herero, also live here alongside oases of fresh water, making a living off the land with their own cattle. You can't get more isolated than the Himba people. They wear few clothes, some jewelry...and carry cell-phones! They're dubious that LIFE APPS can help them: elephant warning systems, tracking cattle -- there are plenty of potential applications. Poor signal strength is one problem; another is that many phones are only 2G. And although the women can't read, they use icons to recognise numbers. 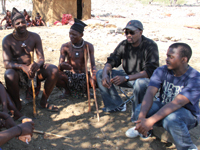 Software developers Dalton and Lameck, from Namibia's capital Windhoek, are determined to persuade the Himba that they can help them with a mobile phone app that will help them market their goods and communicate more effectively.